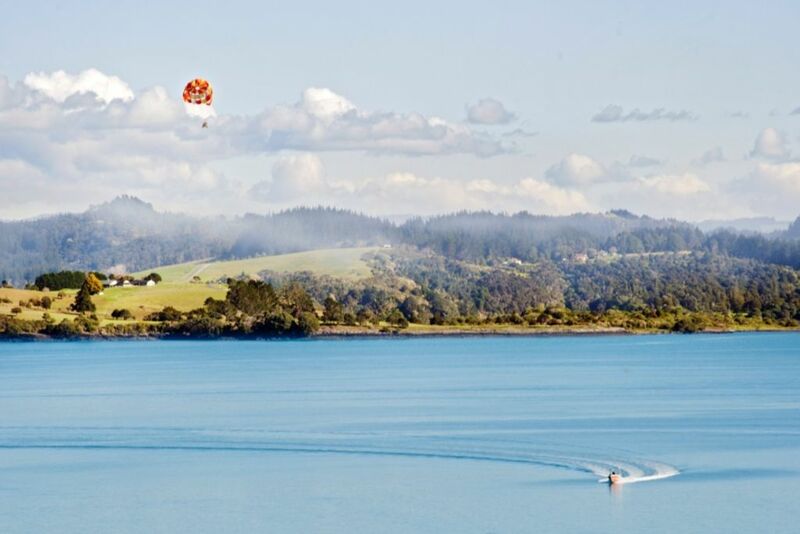 The View holiday house is situated in the heart of Romantic Russell, on the hill in the dress circle, overlooking the village and across the Channel to Paihia. You can sit at home and enjoy it all from your vantage point on the hill, or walk down the zig-zag track into the village below, 3 minutes away for cafes, restaurants, galleries and shopping. This is also a great home from which to explore Russell and the wider Bay of Islands with plenty of land or sea activities for everyone. This holiday home has 3 bedrooms in two separate sleeping areas, separated by a large lounge/kitchen/dining area. The master bedroom with recently renovated ensuite bathroom and large dressing room at one end of the house plus a twin room, queen room and laundry at the other. This area also includes a 2nd renovated bathroom. The central living area and both double bedrooms have stunning views. The combination of a superb location and excellent facilities will ensure that you have the best of everything for your holiday in Russell including the large deck across the front of the house including BBQ and outdoor furniture for al fresco dining with views and sunsets to die for. Activities and boat trips out on the Bay can be booked at the Information Centre on the Wharf. Parking for two cars. Not suitable for boat parking. Not suitable for parking large boats, or children under the age of 10. BYO - bring your own linen and towels or hire them at a cost of $35.00 per person per week. Second visit to this Bach. Second visit to this Bach.Ideal for families.Location excellent.Will likely book again. The view from the house is superb, and the beds were very comfortable. What a view! The house was very close to town and had everything you could need for your stay. What a view! The house was very close to town and had everything you could need for your stay. Would definatley stay here again. Spectacular location and a well equipped modern property. Great property. Very comfortable and relaxing with a fantastic location. Loved the easy walking access into russell or long beach.